This Sacred Heart Of Jesus Medal measures 12 millimeters, approximately 1/2-inch round. Made of 14K Yellow Gold, this piece features a weight of 0.79 grams. It comes ready for gift-giving in a complimentary jewelry box. This Miraculous Medal available from CatholicShop.com features dimensions of 25 X 18 millimeters, approximately 1-inch by 3/4-inch. Made of 14K Yellow Gold, this religious jewelry piece weighs approximately 2.01 grams. It comes ready to give as a gift in a free deluxe gift box. This 14-inch 14K Yellow Gold .75MM Rope Chain With Spring Ring features our money-back guarantee and usually ships the same day if ordered before 6PM Eastern Time. Featuring a width of .75mm, this Rope Chain weighs 0.37 grams. Paired with one or more religious pendants, this 14-inch-long chain makes an attractive necklace. This 16-inch 14K Yellow Gold .75MM Rope Chain With Spring Ring features our money-back guarantee and usually ships the same day if ordered before 6PM Eastern Time. Featuring a width of .75mm, this Rope Chain weighs 0.48 grams. Paired with one or more religious pendants, this 16-inch-long chain makes an attractive necklace. This 18-inch 14K Yellow Gold .75MM Rope Chain With Spring Ring features our money-back guarantee and usually ships the same day if ordered before 6PM Eastern Time. Featuring a width of .75mm, this Rope Chain weighs 0.54 grams. Paired with one or more religious pendants, this 18-inch-long chain makes an attractive necklace. This St. Elizabeth Ann Seton Tiny Saint charm can be clipped on to apparel, backpacks, necklaces, bracelets, keychains and anything you can imagine! About the size of a penny, it's made of soft, rubbery PVC and is super-durable. For anyone with a devotion to Saint Elizabeth Ann Seton, this Tiny Saint charm makes a fun religious gift for any occasion. The packaging even features a biography and information about the devotion. Tiny Saint Add-Ons: Choose an 18-inch black paracord necklace in the drop-down box below to make it a necklace, or select a Tiny Saint Rosary or a Tiny Saint Bracelet and clip your Tiny Saint charm to it! This Mary the Blessed Mother Tiny Saint charm can be clipped on to apparel, backpacks, necklaces, bracelets, keychains and anything you can imagine! About the size of a penny, it's made of soft, rubbery PVC and is super-durable. For anyone with a devotion to Our Lady the Blessed Mother, this Tiny Saint charm makes a fun religious gift for any occasion. The packaging even features a biography and information about the devotion. Amazingly, the apparitions have continued for over 35 years. Millions of people travel to Medjugorje every year in search of answers to life’s biggest questions. The messages given by Mary are a call for mankind to return to God. And, according to Mirjana, the Virgin entrusted her with ten secrets that foretell the future of the world—secrets that she will reveal within her lifetime. Paperback. 369 pages. A portion of every book sold goes to Mary's Meals, a charity which feeds over a million children every day. SPECIAL OFFER: Every copy of My Heart Will Triumph ordered here on CatholicShop.com comes with a free My Heart Will Triumph bookmark! BULK PRICES: CatholicShop.com is the official publisher of My Heart Will Triumph. Buy the book in bulk to save up to 55%. Learn more. This 24-inch 14K Yellow Gold Cable Chain features our money-back guarantee and usually ships the same day if ordered before 6PM Eastern Time. Featuring a width of .50mm, this Solid Cable Chain weighs 0.5 grams. Paired with one or more religious pendants, this 24-inch-long chain makes an attractive necklace. 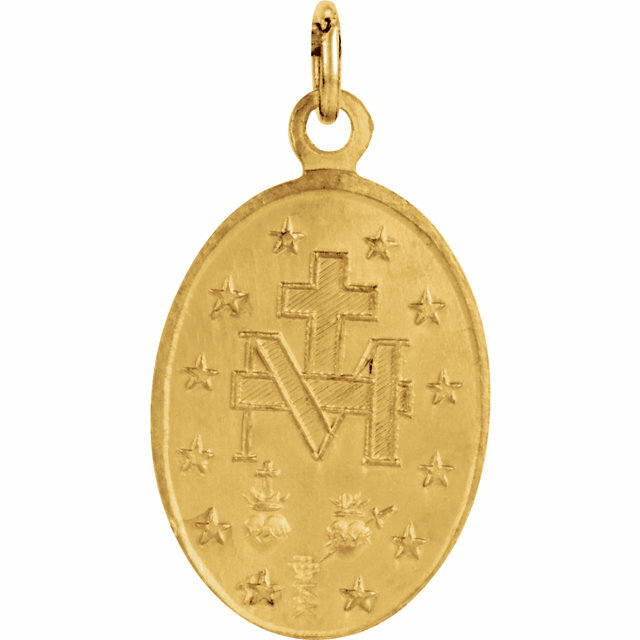 This 14K Gold Small/Medium Miraculous Medal - HALF OFF has passed our quality control assessment and meets our strict criteria to be a Catholic Shop product. Buy with confidence. Catholic Shop aims to carry the finest products on the market. 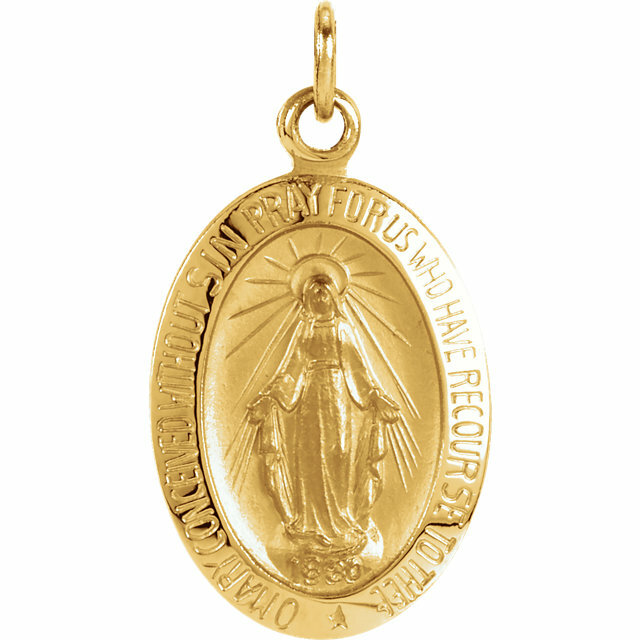 Our staff has inspected and tested this 14K Gold Medium Miraculous Medal - HALF OFF and found it to be worthy of our Satisfaction Guarantee.